Carte De La Cote De L'Amerique. Facsimile: Walch's North America (portion). 1 : 13000000 Walch, Joh. A New Map of Texas Oregon and California With The Regions Adjoining. 1 : 22000000 Colton, G.W. Etats-Unis de l'Amerique en 1860. Map of the United States, constructed from the latest authorities / J.H. Young, sc. from Combination atlas map of Broome County, New York; / compiled, drawn and published from personal examinations and surveys by Everts, Ensign & Everts. 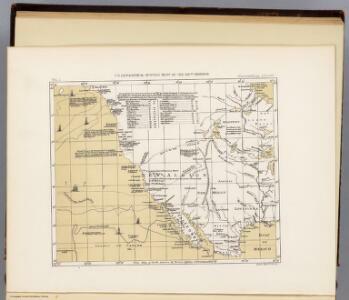 Ornamental Map Of The United States & Mexico. from New illustrated atlas of Dutchess County, New York. / Compiled & drawn from personal examinations, surveys etc. under the personal supervision of O.W. Gray & Son and F.A. Davis, and published under the superintendence of H. L. Kochersperger. Composite: Map of Louisiana and Mexico. 1 : 4300000 Tardieu, P.F. Map of the United States and Mexico: including Oregon, Texas and the Californias. 1 : 9504000 Fullarton, A. & Co.